Set in an alternative reality from the original series, Captain James T. Kirk and the crew of the Starship Enterprise will meet their most terrifying and diabolical enemy yet. This enemy has a personal vendetta against the United Federation of Planets and leaves Earth in an official state of emergency. Captain Kirk goes on a manhunt and could potentially begin a war against an aggressive alien species to retrieve and punish this criminal. Captain Kirk must defeat this formidable foe if he wants to save his crew and planet Earth. “To boldly go where no man has gone before” is what Director J. J. Abrams did with the Star Trek franchise. Star Trek is one of the most influential science fiction TV shows in history. He was given a big job and boy did he nail it…again. The first movie established the premises of the story, while the second movie looked into the relationship between the characters, especially Kirk and Spock. The movie brings a unique humanistic view of the characters that was never seen in the original. Even if you have not seen the original series, Star Trek Into Darkness will hold your attention and will make you wish you had. Marvel and Netflix have just announced plans to partner in the production of at least four new shows on Netflix starring Marvel Comics' heroes, Daredevil, Jessica Jones, Iron Fist and Luke Cage sometime in 2015! Catch up on the back stores of these characters with our collection of comics and graphic novels. Created in 1964 by Stan Lee, Bill Everett and Jack Kirby, Matt Murdock is a lawyer binded by radioactive waste which heightens his other senses. Huses his new powers to fight crime in New York City as Daredevil. Some of Darevil's most influential story arcs include Frank Miller's Daredevil: The Man Without Fear, Jeph Loeb's Daredevil: Yellow and Kevin Smith's Guardian Devil. Created by writer Brian Michael Bendis and Michael Gaydos, Jessica Jones is a disalusioned former superhero who hung up her costume to become a private investigator. Her story can be found in Bendis' 4-part graphic novel Alias (part one, part two, part three, part four) and its 3-part continuation, The Pulse (part one, part two, part three). Luke Cage (created by Archie Goodwin, George Tiska and John Romit, Sr) and Iron Fist (created by Roy Thomas and Gil Kane) have been linked since their two books were combined in 1978. Though never top tier heroes, Luke Cage and Iron Fist have been important supporting characters in the Marvel Universe as Heroes for Hire heping anyone in need... who can afford their price. Look for their origin stories in The Essential Iron Fist: Volume One, and Luke Cage, Power Man: Volume One, then read about their first team up in The Essential Luke Cage, Power Man: Volume Two. These so called "street level" heroes aren't as powerful as Marvel's big names like Iron Man, Captain America, Thor and the Hulk so, over the years, writers have focused on their human stories making them some of the most interesting characters in the world of mainstream comics. “Fathers start as gods and end as myths and in between whatever human form they take can be calamitous for their sons”. A.N. Dyer, the legendary, Salinger-esque author of Ampersand, has just recently lost his closest friend in the world, Charles Topping. Among other concerns, his difficulties in delivering a proper eulogy (which he purchased from an online service), force him to try and reconnect with his two eldest sons (Richard and Jamie), as he feels his youngest boy, Andy (the result of a rumored affair which led to the end of his marriage), will need them after he dies. David Gilbert’s & Sons leads us through the lives of these Dyer men, as well as that of Philip Topping (the youngest child of Charles and childhood “friend” of the older Dyer boys), our narrator. Throughout the book, we witness the lasting damage fathers and sons can and often do have on one another, even when all involved have only the best of intentions. While Gilbert demonstrates great skill when writing about the father-son dynamic, his numerous subplots (which include a novel-within-a-novel, as well as the possibility of a “clone”) occasionally take away more than they add to the overall narrative. In addition, the female characters, (besides a few notable exceptions) are largely ignored and treated poorly. While I ultimately enjoyed the book (and do recommend it), it falls into the “good but not great” category. Find & Sons at the library. "Because we are ghosts living in our heads waiting for the notice that we are dead…"
From the opening swell of “Thank God For The Sinners” and its subsequent guitar chords, vocals and drum beat, you pretty much know what you’re getting yourself into with Twins, Ty Segall’s 5-billionth record. OK, it’s really his 11th under his own name but the man has been prolific in his musical output for the past five years which has been supported, manufactured and distributed by a multitude of labels with this offering being put out by Chicago independent label Drag City Records. The musical content across this whole album is essentially dirty, fuzzy garage rock with varying levels intensity and aggression but most tracks are set at a moderate to highly upbeat rock rhythm the latter of which is quintessentially exemplified by second track “You’re The Doctor” and features the most intense drum pounding on the whole record. It starts off with a rapid guitar strum and a frenzied, psychotic yet classic rock guitar lead which sets the stage for Ty’s raspy, yelping tunefulness. Overwhelmingly distorted guitar chords flourish brightly on tracks like “They Told Me Too” and “The Hill” the latter of which features some guest female vocals which sound like a sampled 78 RPM record from the '40s. Slow burning cuts like “Ghost” and album closer “There Is No Tomorrow” deliver some contrast to the noise and heft that this album almost constantly pushes while “Handglams” lays waste to the challenge of containing all of this albums extremes together in just one song tugging back and forth between soft strumming and all out chaos only to explode with a dual guitar lead interplay which swells out into a slow, relatively clean guitar line mirroring the one that opened the song. There are hooks on this record but the real attractions here are the timbre of the instruments, the live band feel of the recordings and the personal touch with which Ty Segall colors this musical style. There are plenty of well fleshed out layered vocals most of which seem to be Ty’s own multiple dubbed vocals though there are evident guests co-manning the singing duties and those aspects further solidify this LP as being a more song structure based one as opposed to dealing in lengthy instrumental jams like Ty is known to do on some other albums and with some of the other bands he is a part of. There is a level of production which tends to pull the ambiance of this record a little out of the garage and instead a bit more “in the studio” though the inherent contrast to being a pop record is in the raucous noise of the instrumental tracks save for “Gold On The Shore” the album’s sole acoustic track. Honestly, it’s hard to think of this as pop record in any way because it gives an impression that feels genuine and completely lacks a sense of being contrived. It’s a delicate balance but it’s handled beautifully and leaves the listener plenty to explore and enjoy given it’s somewhat minimalist configuration. This is fiery, impromptu rock music that just happened to become a collection of songs. Highly recommended. Find it in the library. Today, short story writer Alice Munro was awarded the Nobel Prize for Literature. The Nobel, one of the most prestigious literary prizes, is given to a writer for a lifetime of work, rather than a single novel, short story or collection. The short press release issued by the Nobel committe call Munro a “master of the contemporary short story”. Bookriot.com has a great post offering suggestions for getting started reading her work. Here are their suggestions with links to reserve them from the library catalog. Start with the title story from her second book, Lives of Girls and Women. Next, read “Differently” from Friend of My Youth. Then, read “The Albanian Virgin” from Open Secrets. If you find yourself hooked after reading these stories, your library is here to help you continue reading the works of Alice Munro. Clay Jannon, a recently unemployed graphic designer, takes a job in an unusual bookstore in San Francisco. There he finds an interesting but small cast of characters: His boss, who has ordered him not to read any of the books on the shelves and the few customers he sees during his graveyard shift that "arrive with algorithmic regularity", without paying for the items they leave with. His curiosity gets the better of him and after opening some of the books he was ordered not to he stumbles on a 500 year old secret society. Robin Sloan worked for a variety of technology companies over the last decade so this book is peppered with sentences like “He has the strangest expression on his face- the emotional equivalent of 404 PAGE NOT FOUND.” It's hard to not like a book that talks about ancient secret societies on one page and merits of different programming languages on the next. Find Mr. Penumbra's 24-Hour Bookstore in the library. 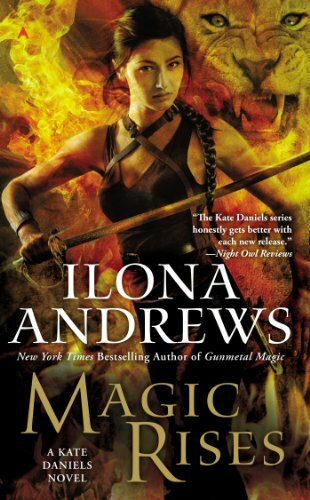 Book six in the Kate Daniels series by husband-and-wife author team Ilona Andrews expands upon the "Post Shift" world. All the previous books have been set in and around Atlanta, Georgia, after magic returned to the world, casting it into upheaval. This time, Kate and her honey, the shapeshifter Beast Lord, are traveling across the treacherous ocean to Europe. Tangled up in the savage politics of the Continental shapeshifter packs and being manipulated by a deadly figure out of her family history, Kate is walking a knife's edge. The characters never fail to be engaging and the settings are rich with their own personalities. Not exactly the best writing ever, but certainly an enjoyable chapter in the saga. This story features the death of a major character, but also introduces a new one that definitely promises to be entertaining. And the ending left me grinning. Can't wait to read the next one! Find Magic Rises in the Library. Warm Bodies is a hilarious romantic comedy loosely based on Romeo and Juliet. You have R, a zombie wanting more in life and there is Julie, a human girl fighting to stay alive after the zombie apocalypse. When R first sees Julie, he realizes that there is something different about her so he decides to keep her alive. The longer R spends time with Julie, the more he wants to be with her. To make the situation more complicated, Julie’s father is the leader of the human resistance group. To make matters even worse, Bonies, zombies who have given up on humanity, are chasing R and Julie to prevent them from changing the world. As a zombie fan, I found this movie to be fascinating and entertaining. Zombies are hardly seen in adoring ways and this movie nails it. R (played by Nicholas Hoult) plays his role as a zombie slowly regaining his humanity because of his love for Julie. In the beginning, R is seen as very mechanical and expressionless, but with his narration throughout the movie, you get a sense of his inner human. Warm Bodies gives an interesting look at zombies, which are traditionally given evil purposes in movies and turn them into sympathetic creatures needing of love. In a small town where nothing happens, things are going to change. It all starts when Jeremy, under the spell of the beautiful Ginger, has his first Prince Cake. The legend says that you'll fall in love with the first thing that sees you during your first bite. Jeremy keeps his eyes closed, but when he sneezes, Ginger is the first thing that sees him when his eyes open. Now he's a willing participant in her schemes. And who knows where that's going to take him? Jeremy lives in a town that's closely associated with fairy tales, his missing mother's favorite reading. He's assisted through life by the ghost of Jacob Grimm. And his world is about to explode. Find Far Far Away in the library. Do You Lie About What You Read? A new survey released found that more than 60% of Britons claim to have read books they haven't to appear smarter. Some of them go to great lengths to convince others that they are more literate than they actually are. Some relied on film adaptions, others keep "important" unread books on their bookshelves. Read more about Do You Lie About What You Read?